We look forward to another huge boss bass night this time with the one and only Utah Jazz headlining. His performance at Chinese Laundry was talked about as one of the sets of the year and we think this one could be even better ! Throwaway D&B this is not. This is fine wine matured specially for the head and the feet: rich in spice, sass and soul. Forget the alco-pops and cheap vodka: Utah Jazz deals in vintage. For when it comes to pedigree, the Jazz is indeed a rare breed: a personal apprentice to D&B’s old masters (alex Reece, LTJ Bukem, Bryan Gee) whose love for both DJ booth and studio saw him emerge as a pioneer on both fronts over the ensuing decade. Representing some of the most hallowed stables in the game - V Recordings, Good Looking, Hospital - Luke Wilson has fully lived up to his tag of “drum and bass royalty in the making” (Knowledge magazine), building a devoted following of enthusiasts for his mesmerising compositions and eye-popping DJ skills. The electric versatility of his soulful dancefloor style has made Luke Wilson one of the most sought-after DJs on the international stage. 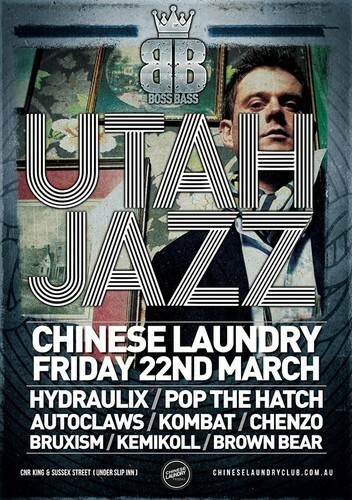 Mixing anything from 1993 LTJ Bukem classics to the latest Sub Focus banger, Utah Jazz is a party-bringer like no other, with one-off dubplates, three-deck mixes and old-skool razzledazzle bursting from his bag of tricks.